Harvest Dance | Boulevard Brewing Co.
John Barleycorn is memorialized in English folk tradition as the personification of the barley plant, sacrificed at harvest time and then reborn as beer or ale. Our Harvest Dance Wheat Wine is a celebration of John’s Midwestern cousin, wheat. Beginning with a large portion of wheat malt, we add an equally generous helping of Hallertau and Citra hops and age the ale on both French and American oak. The result is a big, warming burst of tropical fruit flavors, highlighted by subtle wine-like notes, and rounding slowly to a long, dry, oaky finish. Huge white head; spotty lacing. Pineapple & grapefruit in the nose; wow! Pineapple & grapefruit are joined by wheat & booze in the taste. Not as mindblowing as the nose, or the draft version; still tastes like a delicious IIPA. Worthy. UPDATED: AUG 5, 2015 Poured a frothy, off-white head (Lots of it), clear and golden in color ; strong aroma of wheat/bread; a lot going on in the flavor department, too much for my untrained palate to unravel, but I did get sweet, some sour, and definitely fruity; medium body, fizzy. Interesting beer, and I am glad I tried it, and there may be much in it that is lost on me, and, although this beer was a little too much like champagne for my tastes, EDIT this is something I would consider buying again, because, after tasting it again a few days later, I am impressed at how sweet it is, and how much I like it (although I don’t care for the tartness in it). I am upping the rating. Pours a glowing, almost clear coppery amber, swimming with fine particulates amongst rising effervescence, producing a huge, 3+ fingers (so rapidly developing as to be difficult to pour), billowy, off-white, long lived head that leaves chunky motes, streaks & wisps of lace. Aroma is wheat, a wide assortment of sweet fruity esters: apple, banana, cherry, lemon, melon, orange, peach, pineapple and possibly others I can't define. I also detect some grapefruit & faint pine. Taste is sweet, heavy to wheat with some soda biscuit hints, yeast, fruity notes are numerous but are not as diverse as in the nose: heavy to orange, with fainter lemon, apple, peach & pineapple. Finishes semi-sweet, with a vinous dryness & some pepper, but more heavily to alcohol, spice (the alcohol portion of which is probably responsible for the dryness). Aftertaste is fruity, alcohol spice & bitterness. Mouthfeel is medium-heavy bodied with high carbonation, thick with chewy creaminess, alcohol warmth & spice. Many of the reviews I have read state that the alcohol is well hidden but I must respectfully disagree as I can detect it not only as warmth in the mouth & gut but also in the spiciness & bitterness that it produces. It's smoother than a baby's bottom. Another awesome beer. John Barleycorn would be proud (listen to the Traffic Version). This is one of the beers we like to finish with. Look: It pours dark golden with a fluffy slightly off white head. Smell: It has aromas of citrus highlighted by orange, a wheat profile with citrus fruit, vinous (white wine), and oak aromas. Taste: There are tropical fruit flavors, wheat, vinous (white wine) and oak. The combination of flavors is very complex and works well together. Feel: It has a chewy feel, not as heavy as traditional as expected. It has alcohol warming with a dry finish. Overall, it is a unique favorable beer complex in aromas and tastes that is slow drinking and quite tasty. 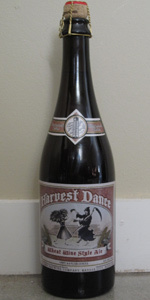 Harvest Dance from Boulevard Brewing Co.